Animal Wildlife | Magellanic Penguin | The Magellanic penguin is a small to medium sized species of penguin found inhabiting the rocky islands off the coast of parts of South America.The Magellanic penguin is most closely related to the African penguin,the Galapagos penguin and the Humboldt penguin which it is similar in appearance to.Despite being classed as a threatened species,the Magellanic penguin is one of the most numerous of all of these types of penguin.The Magellanic penguin is found breed off the coast of Argentina and southern Chile and on the Falkland islands further south.Like other species of penguin the Magellanic penguin spends the majority of it's time hunting for food in the surrounding ocean,coming onto land to nest in large colonies on the beaches. The Magellanic penguin is a medium sized penguin that can grow up to 76cm in height. Like other penguin species, the flippers of the Magellanic penguin are not that long but act as the perfect tools for propelling the Magellanic penguin through the water when it is in search of food. Like the other penguins in their group, Magellanic penguins have white and brownish black markings, with a broad dark band running across the top of their white chest. Like other penguin species, the Magellanic penguin is a highly sociable bird, living in flocks with numerous other Magellanic penguin individuals. As well as gathering together in large colonies on the beaches during the breeding season, the Magellanic penguin flocks also spend their time out at sea hunting together rather than on their own. The Magellanic penguin is a carnivorous predator and it's diet is solely comprised of marine-dwelling animals. 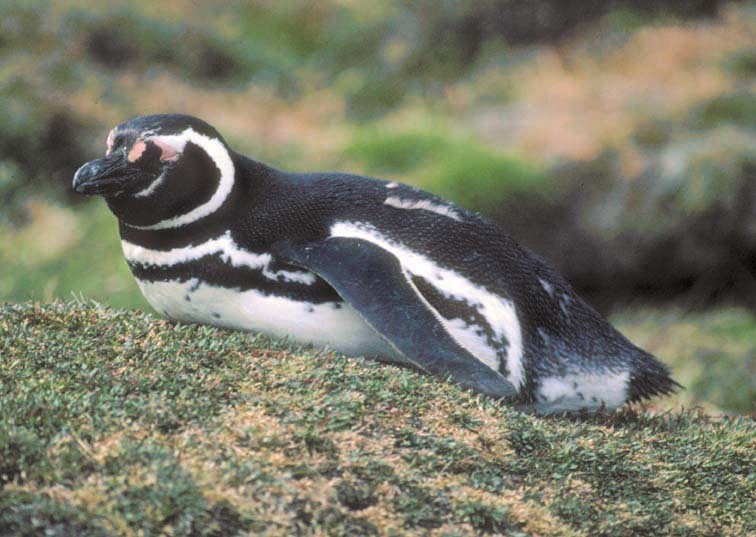 The Magellanic penguin primarily hunts cuttlefish and squid in the surrounding waters along with numerous species of fish (including sardines), and krill. Like other penguin species, the Magellanic penguin can dive quite deep for a few minutes at time in order to catch their prey. The relatively small size of the Magellanic penguin means that it is preyed upon by a number of hungry marine carnivores. Leopard seals and large fur seals are the primary predators of the Magellanic penguin along with sharks and killer whales. Due to the fact that they nest on quite inhospitable land though, the Magellanic penguin has no natural predators on their breeding beaches. 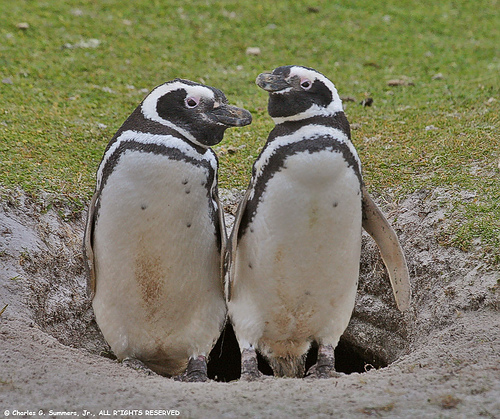 Magellanic penguins nest together on beaches on the rocky islands in their natural range. The female Magellanic penguin lays two eggs in a nest on the beach which are incubated by both parents for up to 40 days. Once hatched, the chicks are cared for by their parents until they are about a month old and are able to fend for themselves. 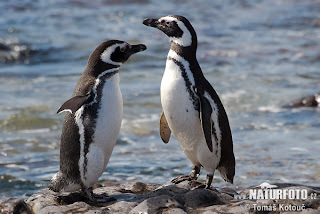 Today, although quite numerous in some parts, the Magellanic penguin in considered to be a threatened species primarily due to changes in their natural habitats. Oil spills are thought to be the biggest threat to the Magellanic penguin and their native breeding sites across south-east Pacific. 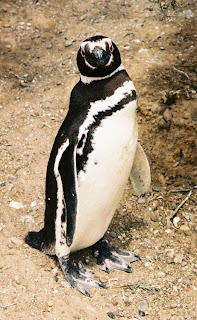 0 Response to "Magellanic Penguin"